Added to the list of games playable on the Tokyo Game Show floor this week is Irem's Disaster Report 4: Summer Memories, the latest and greatest catastrophic adventure, now on the PlayStation 3. You may know the series as Zettai Zetsumei Toshi, Disaster Report, SOS: The Final Escape or Raw Danger, but in Japan, they're calling the latest entry Zettai Zetsumei Toshi 4: Summer Memories. Regardless of how you know the series, the PS3 version is looking sharp, based on the single screen shot Irem has released. Well, about as sharp as Irem is capable of. 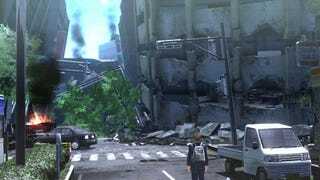 Disaster Report 4 will be playable in stereoscopic 3D at TGS. We'll let you know how it shakes out.